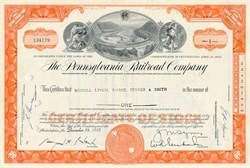 We are offering this historic and beautifully engraved Stock Certificate issued by the Pennsylvania Railroad Company . This cancelled document has an ornate border around it with a vignette of two allegorical men on both sides of a two trains going around a horseshoe curve. This historic certifcate was issued in 1950's which makes it over 46 years old. The green certificates were issued in the early 1960's.